Perhaps there was a violent storm raging in the northern Pacific. Perhaps the storm came up suddenly, while the little bird was in flight, starting its migration from Kamchatka to Cambodia. Perhaps the creature became separated from a flock and flew down the Alaska and British Columbia coast instead of the northern Asian coast. Perhaps it was exhausted and a bit desperate. We’ll never know. 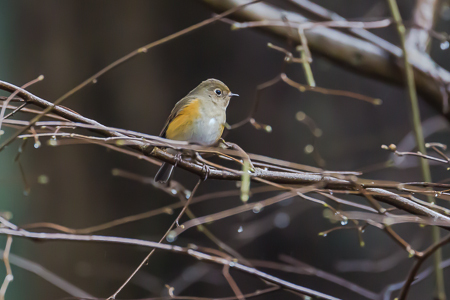 All we know is that one Red-flanked Bluetail, entering its own personal Twilight Zone, ended up alone in the winter drizzle of a Vancouver, British Columbia, park. An observant person sketched the bird’s coloration and showed the sketch to an expert, and the unusual visitation was confirmed. This tiny bird of the Russian taiga decided to make the best of its wintering grounds, and began daily circling a little territory under the cedars, which included a childen’s playground, two picnic shelters, and scattered logs and brushy islands where it could perch. Meanwhile, its arrival spurred a sensation, spread at Facebook and Twitter speed, with birders flocking from all over North America, arriving by plane and car and SkyTrain and on foot, to experience the wonder of this little creature. Some days, there were 60 people at once. The Bluetail was pretty much unperturbed by its newfound celebrity, and went about its rounds regularly, the people following it like disciples following a mystic. 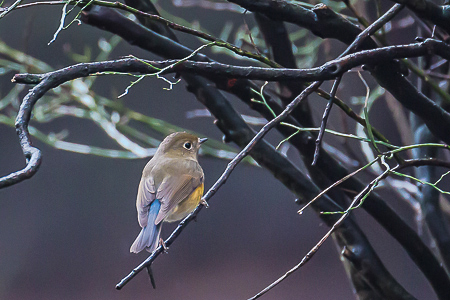 We drove the 220 miles to Vancouver to see the Red-flanked Bluetail on a recent Sunday. At the Canadian border, the guard asked me the name of the bird when I told him we were going to see a specific bird, and I answered correctly (I think he was trying to trip me up). He let us through, mentioning that they had experienced a lot of people coming north to see it. We drove through busy neighborhoods and ended up in the community of New Westminster, where we entered Queen’s Park. We parked our car, then a local dog walker pointed the way to a small cluster of birders, and we joined them and almost immediately saw the target bird. During the two hours of our visit, there were friendly local Canadians, as well as a man from Georgia and another man from Harpers Ferry, West Virginia. One young teen was perhaps the best birder there, with acute hearing and vision and a passion for birds that can lead to a life-long obsession. Later, we ventured to a neighborhood of old homes in Vancouver, where we wandered down a back alley and trained our binoculars on a thicket in a small yard, where there was another rarity: a Brambling. This one had been reported by a kindly homeowner who fed the birds and noticed a strange one among the regular Golden-crowned Sparrows and House Finches. The Brambling is also from Eurasia, and is a bit more common than the Bluetail (which had last been seen on one of the Channel Islands off Los Angeles). Still another wanderer, a Citrine Wagtail, was observed for a couple of months on Vancouver Island, beginning in November and ending with its disappearance in January. I didn’t get to see that one, but it was as rare as the Red-flanked Bluetail and also attracted human observers from all over North America. We can all feel sorry for these lost little souls, so far from their kind and their familiar surroundings. Yet we can also imagine them as castaways, trying to keep life going when the going has gotten rough. Sometimes people have been stranded on remote islands by a storm, and they try to make the best of it. 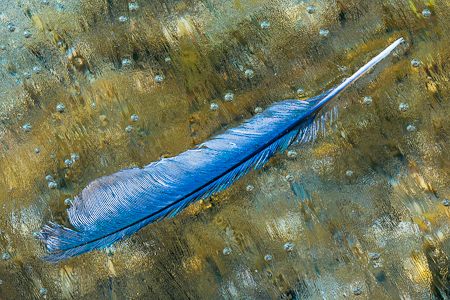 Birds can end up the same way, and sometimes evolution can lead to a whole new line of colorful creatures in an unexpected place. Carry on, brave little Bluetail. I hope you make it home. I don’t have the ears or eyes or passion to be a great birder, but I admire those who are. One of my favorite movies of all time is the gentle comedy/drama The Big Year, which follows several birders traveling all over the country trying to see as many different kinds of birds as they can in one year. It stars Steve Martin and Jack Black. Both are great in the film, and play the roles with an uncharacteristic laid back charm. 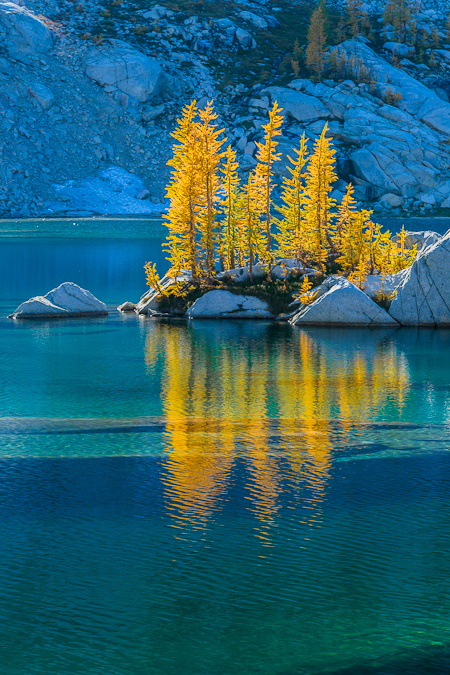 Our goals for the two days in the Lower Enchantments were modest: we wanted to explore the shores of Inspiration Lake and Talisman Lakes, and hike up to Gnome Tarn to get the classic and oft-repeated photograph of Prusik Peak reflecting in the tarn. Distances are not long up here, so our day hikes were to be at a leisurely pace, allowing us to photograph these Indian Summer days to our heart’s content. One hike took us to Prusik Pass. When we reached the pass, there was a cold torrent of wind funneled over this low place on the ridge. We had to put on extra layers, and we watched as the forest fires on distant ridges blew up in billows of fresh smoke. I was photographing when I heard a sudden shout of horror: one of our group had his camera on a tripod, and a sudden blast of wind tossed it right off a ledge onto the rocks below, damaging an expensive piece of equipment. I learned a quick lesson by his experience, and clung to my gear as the wind howled. From Prusik Pass, we bushwhacked up and over a ridge to get to Gnome Tarn. The tarn was diminished in size by a seasonal drought, so the shores were extensive and muddy. Clouds skittered across the sky in the high winds, sending their shadows racing to keep up. A Peregrine Falcon zoomed overhead. Below us, a pair of male Mountain Bluebirds, the color of sky captured in feathers, were a perfect complement to the golden Alpine Larch needles where they foraged. Since the shore was so muddy, I laid down atop a plastic bag and waited patiently or impatiently for the sun to light up the peak in between long periods of shadows. I also waited for the wind to subside, so that the ripples on the tarn would diminish, making for a better reflection. With my companions, I waited … and waited … and got chilled almost to the bone. 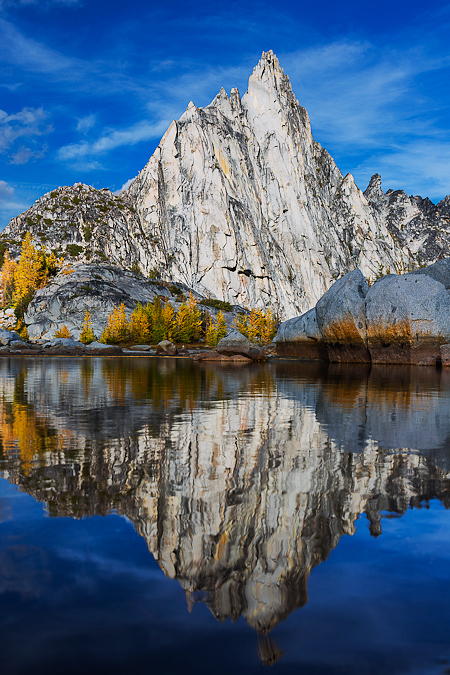 But the peak was finally revealed enough that I got some good pictures of The Enchantments’ iconic peak. 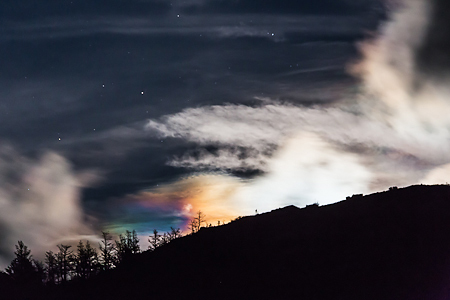 Toward dark, the clouds grew thicker, and several of us decided that the peak had passed. The most persistent among us (not me) hung on longer, and got the best pictures of the day. Oh well; it’s always hard to know when to hold em or fold em in poker, and sometimes photography is the same way. 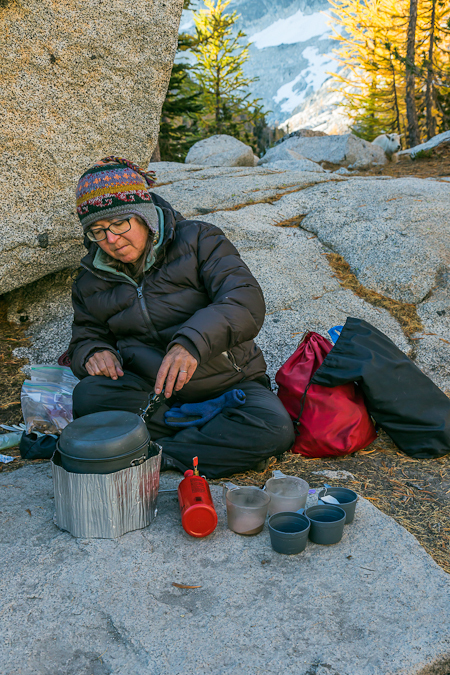 We cooked a late dinner of Backpacker’s Pantry Pad Thai and crawled into our tents. Or at least most of us did, I stayed out in the dark to try and get a few more pictures. The sky had cleared substantially by now, though there were still some clouds racing by. 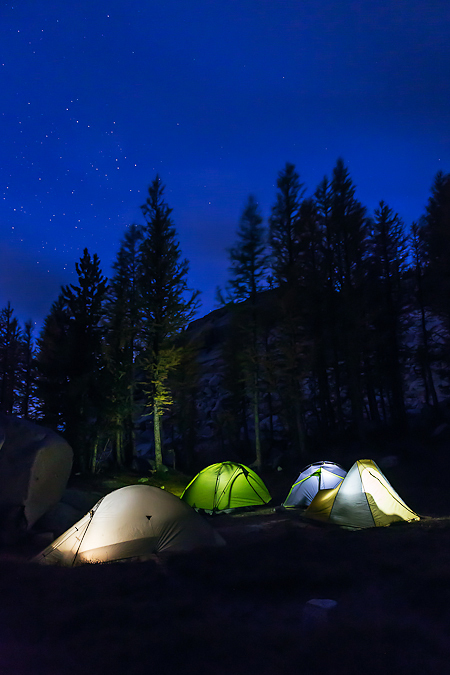 I was struck by the look of all four of our tents lit up by headlamps, so I asked everyone to cooperate for photos of the group of illuminated tents looking like fragile, glowing nylon fairies in the night. 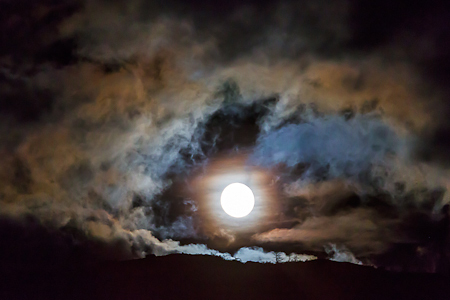 Then I noticed the clouds over a distant ridge; a full moon was rising and backlighting the clouds that were racing over the ridge. 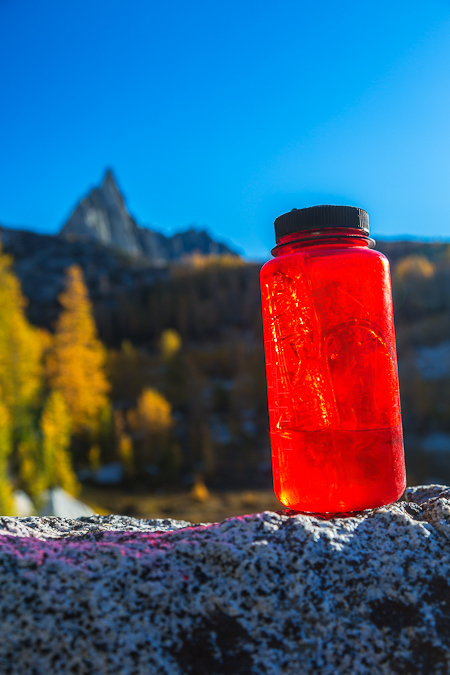 The next morning was to be our hike into the Upper Enchantments, which I’ll describe in another blog post, but before beginning that hike we went about our regular morning activities. 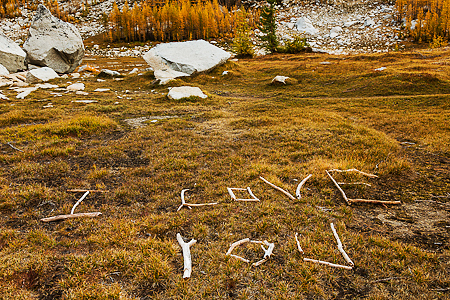 These included a pre-dawn hike up the rocky slope behind camp to Inspiration Lake, where there was lovely dawn light on the surrounding peaks–and where the outhouse was located. Actually, it was not really an outhouse, since the vault toilet had a seat, but no walls. 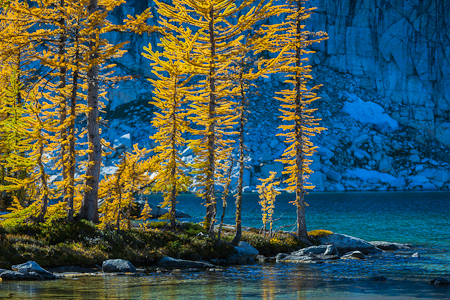 It was more like a throne with a great view through a sheer curtain of golden larch needles. It was beautiful enough to encourage us to “Skip to the loo …” Sitting there, I knew I was missing some great light, so I tried to speed things along, and eventually finished and ran down to where I had left my camera and tripod. 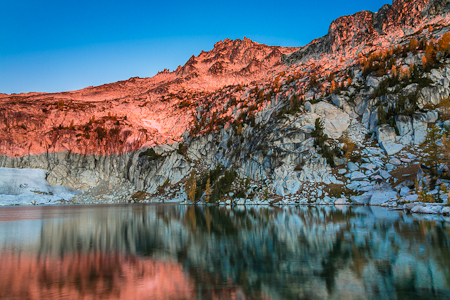 Fortunately, I was not too late and was able to capture the red glow on the ragged peaks towering over the lake. 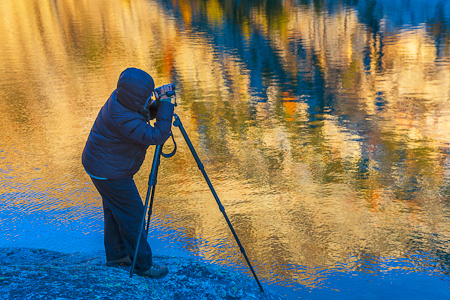 Karen creating a dawn video of the beautiful light on Inspiration Lake–and thank goodness for that warm layer of down! 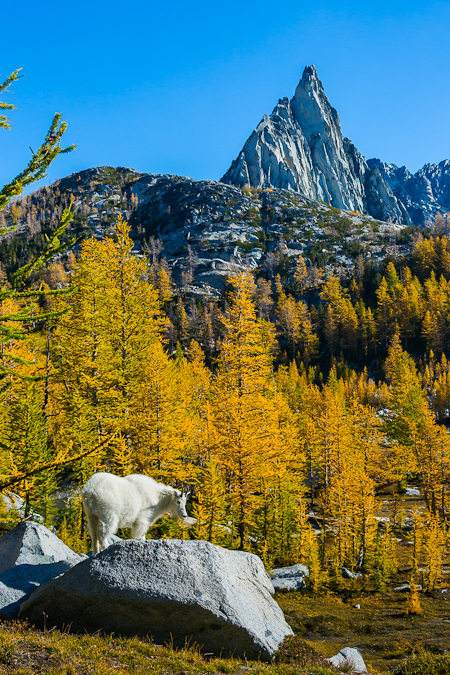 Each morning was cold in The Enchantments; after all, we were in the mountains in October, when the golden Alpine Larches were spreading the word that the end of warmth was near. One of our group was a young guy with not much meat on his bones, and he shivered and lay wide awake all night. He said: “It was almost the worst night of my life.” When I asked him what night had been worse, he replied “Well, I can’t think of any.” He decided he had gotten all the great pictures he needed, and decided to hike out on his own, two days early. It’s a good thing he got out when he did, because the next morning it was 16°F, which makes me shiver just thinking about it. It was so cold that it was painful to brush our teeth, and the water bottles were nearly frozen solid. 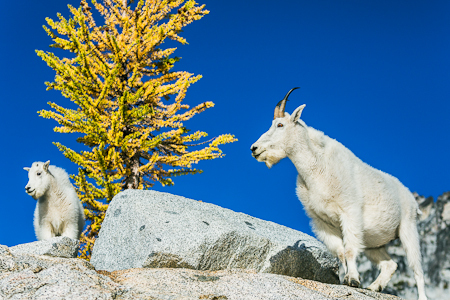 We met occasional hikers in the high country, with more as the days sped by and people realized that The Enchantments weren’t going up in flames. I often wear a University of Michigan baseball cap, which advertises my alma mater. It is amazing how many people I encounter in the Pacific Northwest who grew up in Michigan, went to the University of Michigan, then moved out West for better economic opportunities. It is a real brain drain for Michigan, but that is another story. 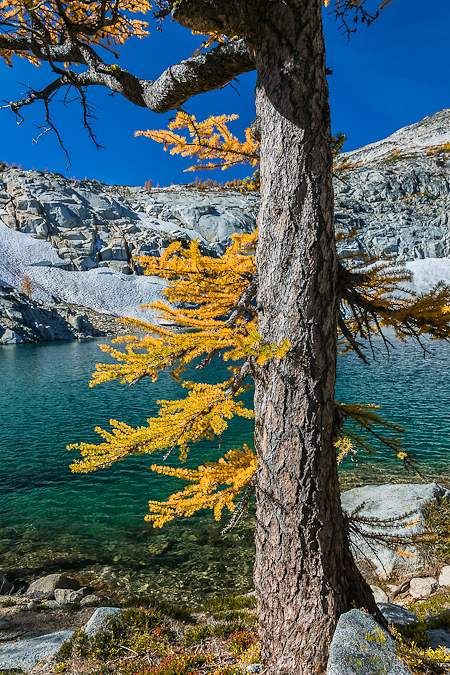 Old and young Alpine Larches, blazing gold, were everywhere in the Lower Enchantments. 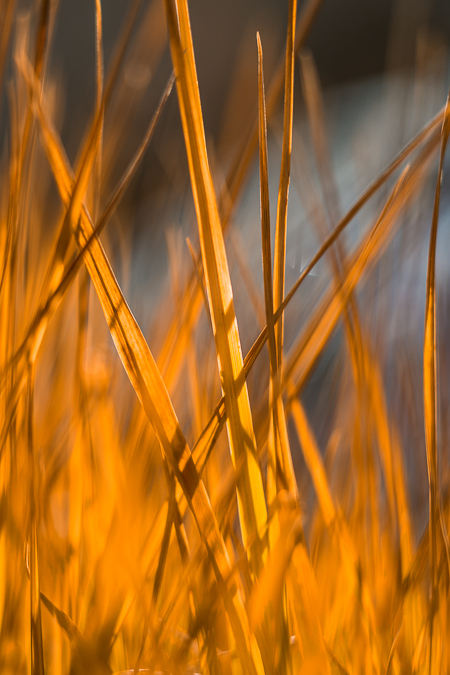 As the week wore on and the cold and high winds took their toll, more and more needles lost their color and fell, but there were still concentrations of intense gold. I grew up in the Midwest and have lived in the Northeast and the Rocky Mountains, so I am well-acquainted with autumn colors: Red Maples burn with scarlet intensity in the Upper Peninsula of Michigan; Sugar Maples glow brilliantly in Vermont; and Trembling Aspens shiver with golden light in Colorado. 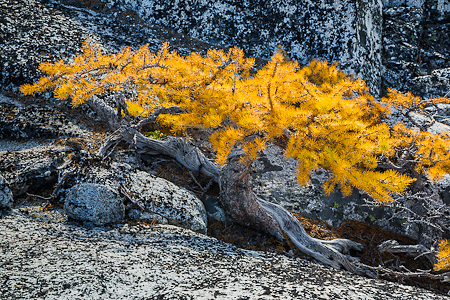 Here in the Northwest, autumn color was a bit of a disappointment until I learned about the timberline Alpine Larches. 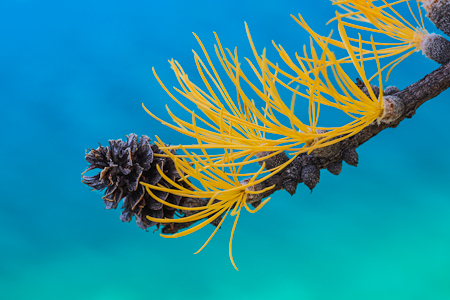 These are unusual, in that larches are a decidious conifer that somewhere along the evolutionary path strayed from the law that conifers are evergreen. Even here in Washington, the Evergreen State, they drop their needles. 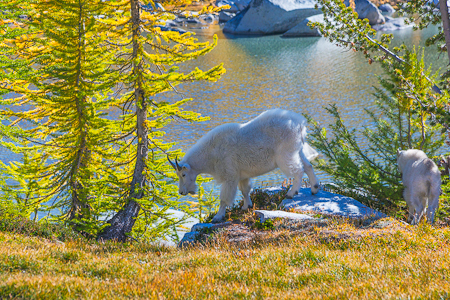 For a tree living at timberline, where snow falls by the foot rather than by the inch, there are certain advantages to losing needles. The trees don’t have to carry as heavy a snow load with all the needles gone, so branches are less likely to break. 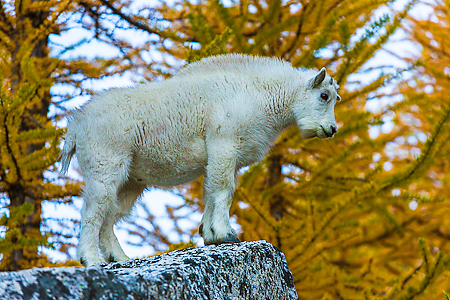 Without needles, the larches don’t have to feed hungry Mountain Goats all winter. The trees don’t suffer as much from the dessicating effects of frigid winter winds. Perhaps most important, the vital amino acids, which are the building blocks for healthy needles, are safely tucked away in the roots and trunks of these trees living on the edge. 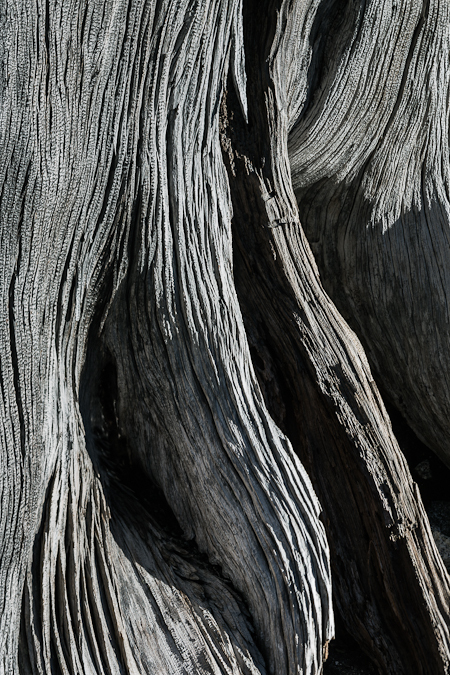 The other trees growing at timberline were the Whitebark Pines. 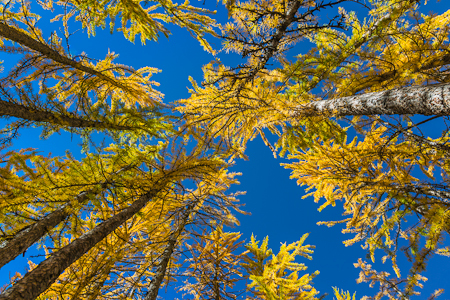 These pines were more scattered than the larches, and have a fascinating co-evolutionary relationship with Clark’s Nutcrackers that I described in an earlier post about Clark’s Nutcrackers in Banff National Park. We observed several of the nutcrackers flying through The Enchantments, commuting to their favorite trees. 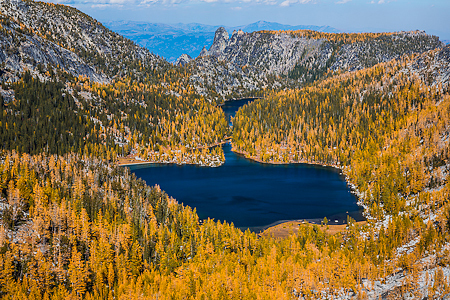 Whitebark Pines are threatened by White Pine Blister Rust, a disease imported from another part of the world, and by the Pine Bark Beetle, which has exploded in population as our climate has warmed. 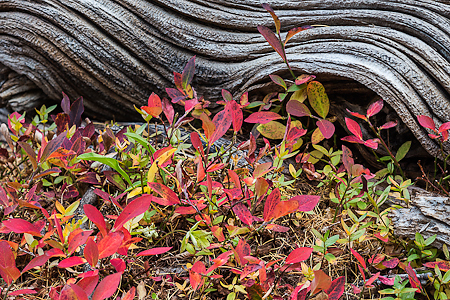 Huckleberry leaves were scarlet, but there weren’t many berries to sample: it was another bad year for the bears. 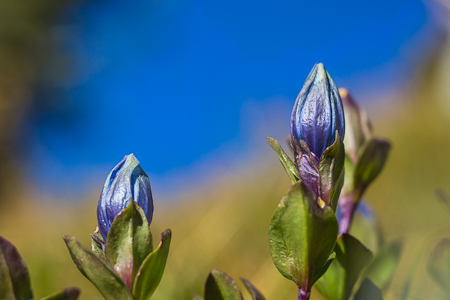 Mountain Bog Gentians bloomed in our campsite, and there were occasional purple asters along the trails. I associate these species with the last gasp of the dying summer in the high country, but it’s nice that they provide a bit of vivid purple to the landscape. 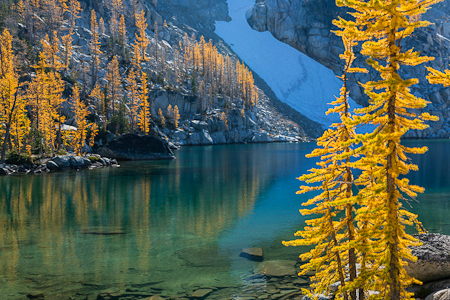 We camped on Perfection Lake, or was it Rune Lake? Both names are used. 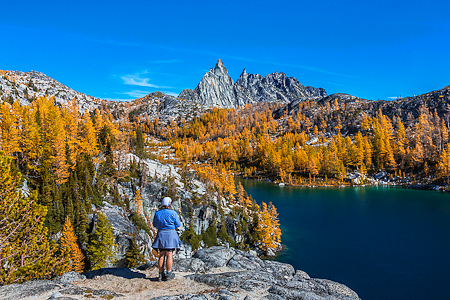 The U.S. Forest Service originally established the place names of The Enchantments, and used such workable but rather dull names such as Perfection Lake, Inspiration Lake, and Isolation Lake. 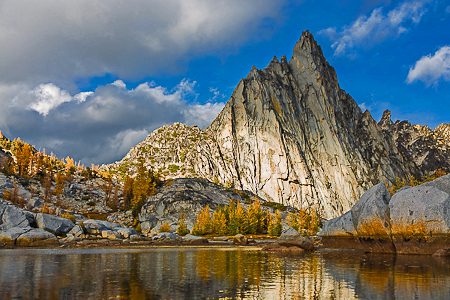 But the names got complicated when Bill and Peg Stark began visiting The Enchantments starting in 1959, and gave new names to the lakes, tarns, and peaks, based upon the legend of King Arthur and Norse mythology. Thus Perfection Lake also became Rune Lake. Inspiration Lake became Talisman Lake. Gnome Tarn is a name of their creation, as is Aasgard Pass. 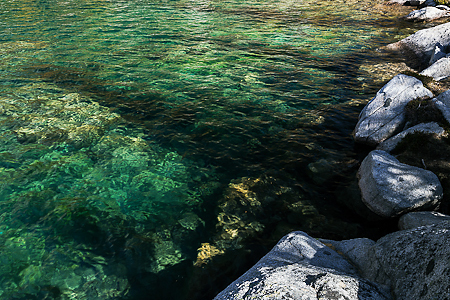 The place names of The Enchantments are now officially a blend of the two naming conventions, and there is enough overlap to cause plenty of confusion. Which makes the experience more fun. Myself: I love all the mythological names. 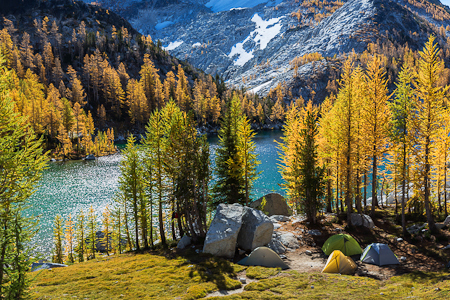 Can you imagine a more beautiful setting for a campsite? 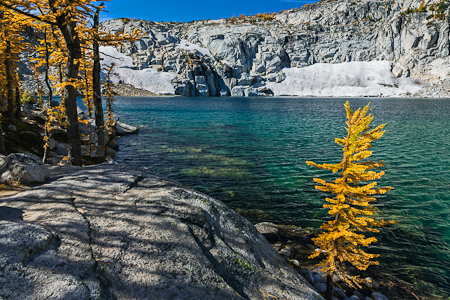 On these golden days in the Lower Enchantments, there was plenty of leisurely time for watching a pair of Meadow Voles leap from their grassy nest, and examining the texture of ice forming on the edge of a pond. 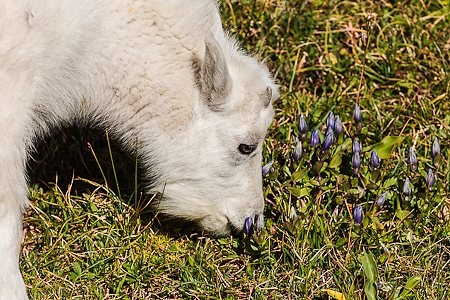 Sometimes, people get so wrapped up in hiking long distances in the mountains that they fail to stop and smell the gentians. Not us: we revel in these long days of nature observation and photography. A highlight was twice seeing a Douglas Squirrel race by, along the shore of Talisman Lake, with a big mushroom in its mouth. Mushrooms are a favorite food of squirrels, and they often store a mushroom among the twigs of a shrub, perhaps to dry it out for later storage or perhaps to let the rain leach out toxins. I’m not sure which, but I find the behavior fascinating. Can it really be instinctive to temporarily store a mushroom in the open? Other wildlife was scarce; the marmots had apparently already entered hibernation. 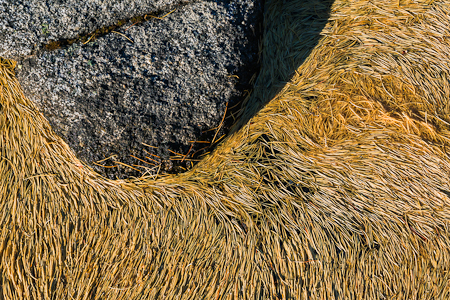 We saw a single Pika and found its stored haypiles near our camp. 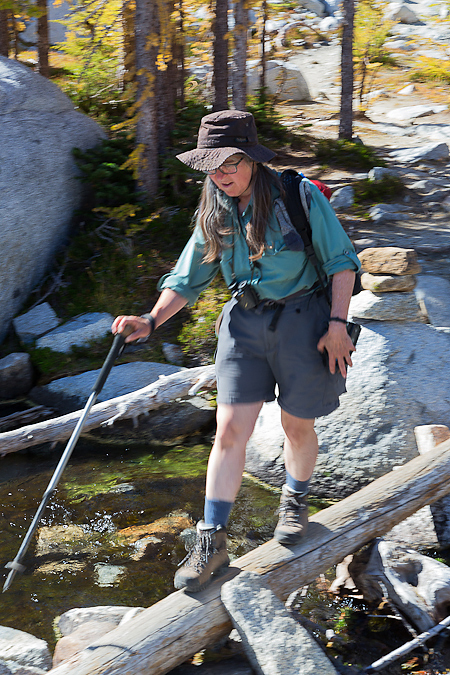 Karen crossing a log bridge over the outlet for Talisman Lake; we had a long stop here while I temporarily repaired my broken pack waist strap with duct tape (the kind young man who gave me the tape laid down on this log while waiting for my time-consuming repair to be completed, and he somehow rolled off the log into the stream and got soaked!). 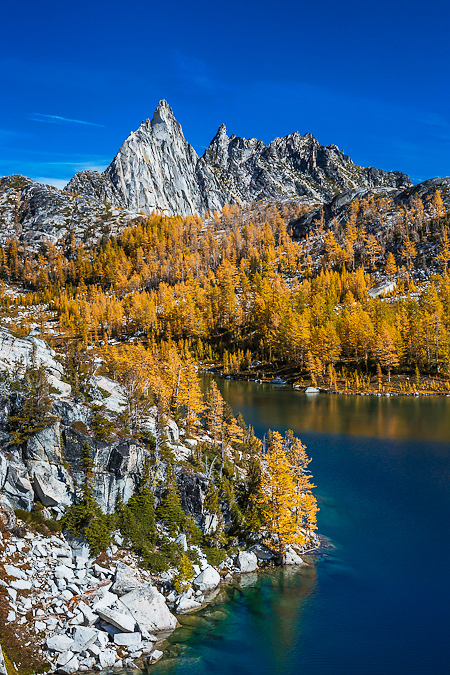 In the next and final installment of “The Enchantments in Autumn” story, I’ll go above timberline to the Upper Enchantments, which has a stark beauty all its own. 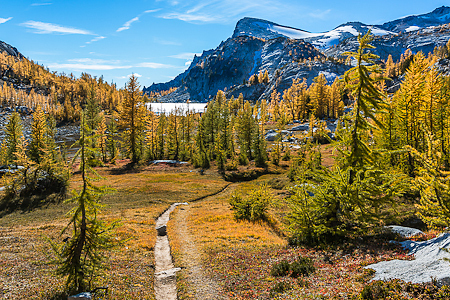 For more information about hiking in The Enchantments, go to Washington Trails Association and Recreation.gov. 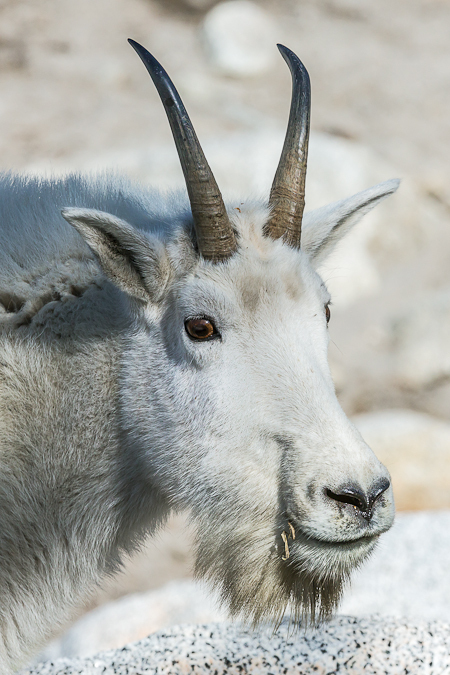 To read my other blogs about The Enchantments, go to The Long Ascent and Mountain Goats. 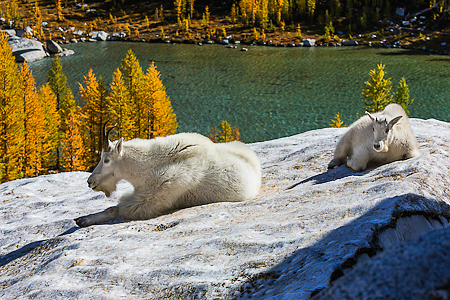 There is also a good web site that is based upon the autumn experiences of the Starks and another couple called 50 Years in the Enchantments. 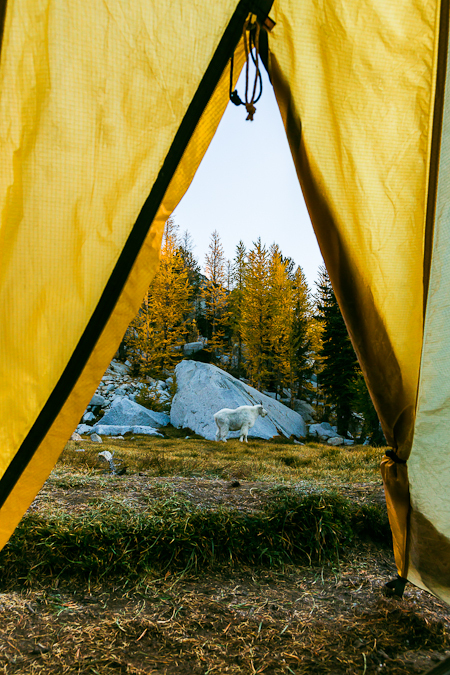 When we awoke on the third morning, one of our companions said “Hey, everyone; there are Mountain Goats out here!” We quickly donned warm layers and grabbed camera gear, then scrambled out of the tent. A nanny and her kid were just outside our tents, and appeared to be waiting for something. A playdate, perhaps, just like a meeting in Green Lake Park of the nannies and kids of Seattle’s high tech wealthy? I’ll get to that later; but for now the wonder of the experience of being so close to these wild creatures was awe-inspiring. 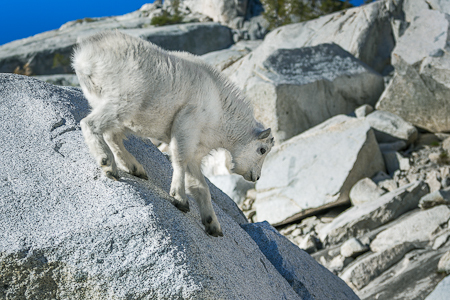 The kid was adept at climbing boulders and clinging to steep rock faces where I wouldn’t venture. 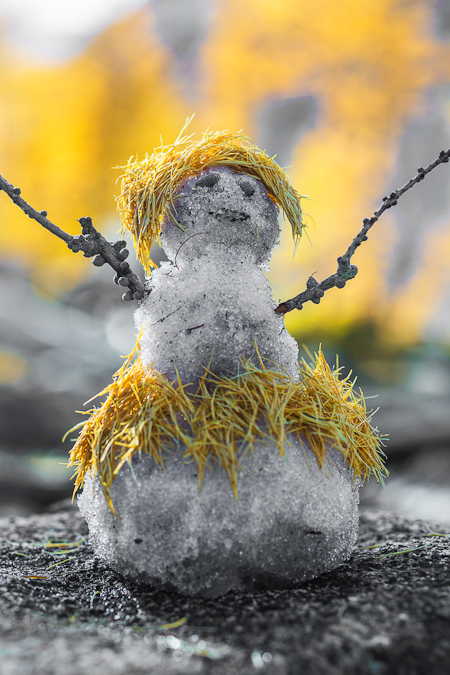 This early practice gave the little guy–and he was a guy, according to one of the human female members of our merry band of hikers–good preparation for the long winter ahead, when all the humans are long gone from the high country, snow is twenty feet deep atop the frozen lakes, and the winds begin to howl. 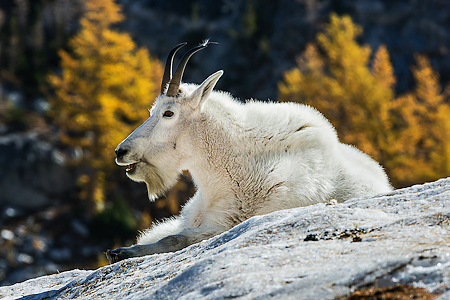 During that time, the nanny and kid will be high on the cliffs of The Enchantments, using their best tool–their flexible hooves–to cling to sheer faces and dig for dried sedges and other bits of nourishment. It must be a hard life. 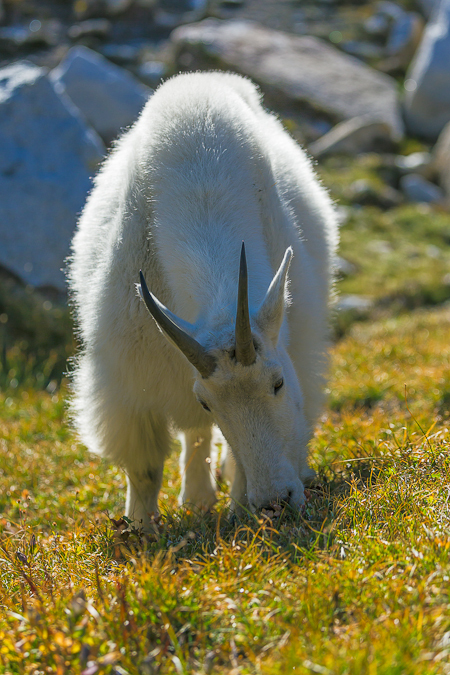 But these high cliffs are blown almost free of snow by the wind and by their very steepness, which means there are ledges nearly bare of snow where the goats can scratch out a living. 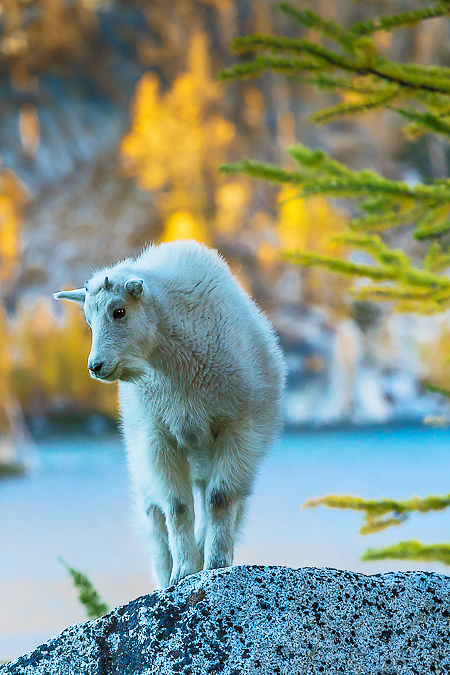 At least the goats stay warm all winter. 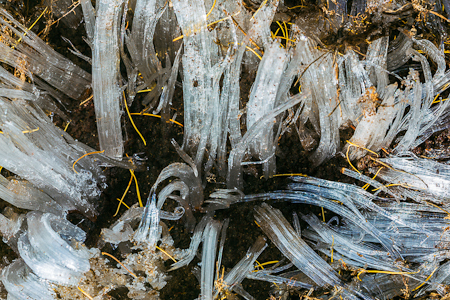 Their long hair makes a great insulator, and if they can eat enough food, the bacteria in the gut actually keep the animal warm–much as a compost pile’s bacteria heat the whole heap. 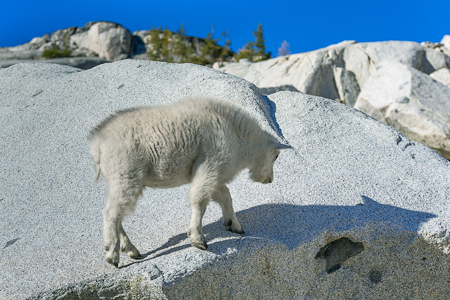 Mother and child like to keep in eye contact with each other, much as humans do. When a pair lost contact with each other, both made soft bleeting sounds that helped them find each other. Frequently, the kid would wander just a bit too far from the mother, and would suddenly break into a run to get closer to her. 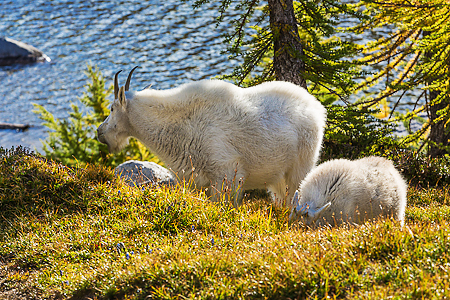 Nanny goat wasn’t entirely motherly by human standards. If the little kid got too close while she was feeding, she would give it an aggressive thrust of her head and wickedly sharp horns, and the little kid would back off, seemingly with an expression of “What did I do wrong?” This behavior would serve the little guy well in the future, as there is a hierarchy of dominence among all the bands of goats, and everyone is more content if they know where they belong in the workplace pecking order. One morning a band of five female nannies and kids wandered down the mountain into our campsite, where they joined our regular two residents. I’m sure that the regulars and newcomers already knew each other quite well, but just to remind each other just who was the queen and who were the commoners, there was plenty of staring and glaring and thrusts of those deadly horns. Eventually the newcomers moved on, and our regular nanny retained the title of Queen of our Campsite. 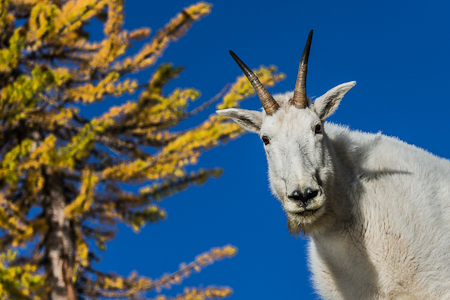 By the way, I said at the beginning of this weblog that I would explain why the Mountain Goats camped with us for four days. I would love to say that it was because they enjoyed our companionship, or that they perceived that they were safer from Mountain Lions when they stayed near us. The truth is much more prosaic and much, much grosser. 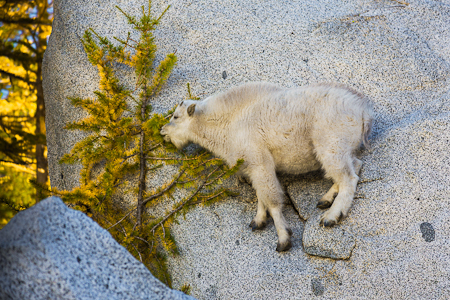 You see, Mountain Goats love salt. They are addicted to salt. They dream of lapping the great salt lick in the sky. To them, humans are simply a mobile source of salt. 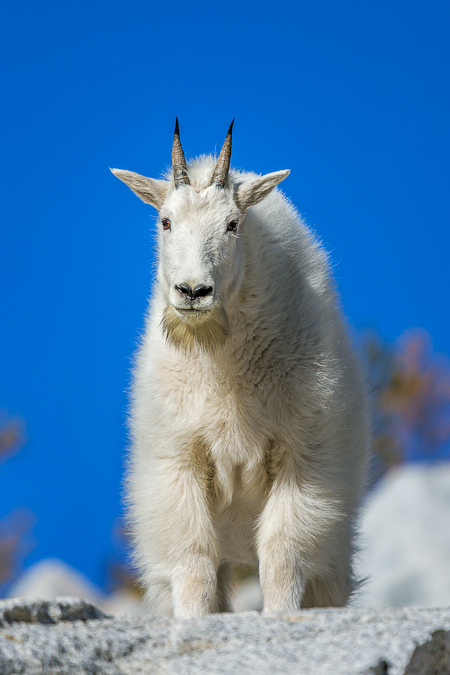 I remember talking to a young female employee in Glacier National Park years ago when I worked for the National Park Service, and she described how Mountain Goats would walk up to her, when she was hiking in summer shorts, and lick the sweat off her bare thighs. But wait, it gets worse. 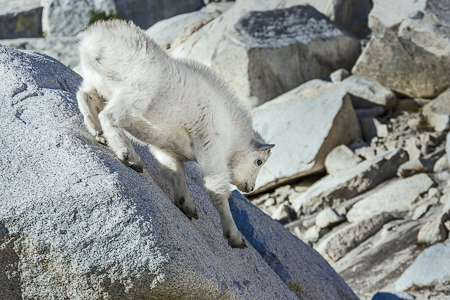 Mountain Goats have also come to associate people with another source of salt: human urine. 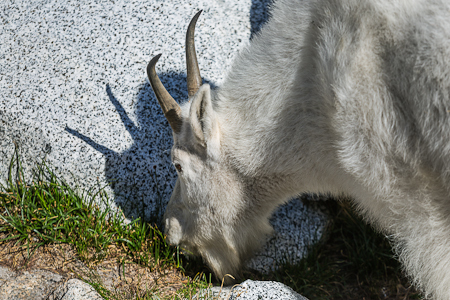 Truth is, we all gotta pee, and the goats seek out the places we peed in order to lick the salty fluid from the granite or eat the soft soil saturated with golden liquid. That, and that alone, is the reason they hung around camp. Each time one of us would quietly leave camp in order to relieve ourselves, the nanny would take notice and follow him or her to a secluded place. Then the rest of us would hear a shout as the horny creatures ventured too close. 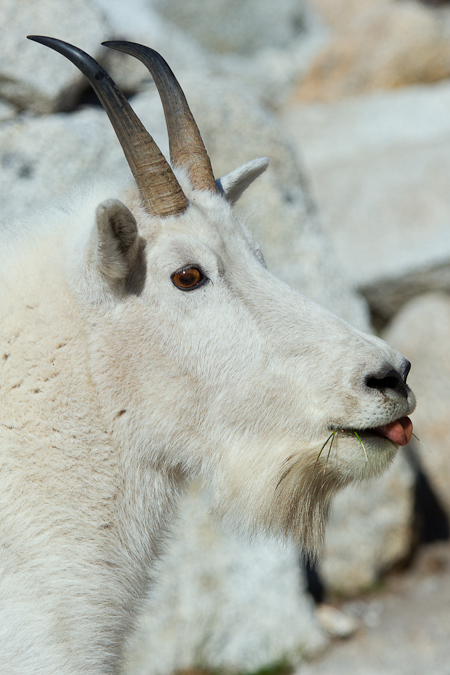 Karen taught the nanny the meaning of the word “NO!” by pointing her finger at the goat and loudly saying the word. 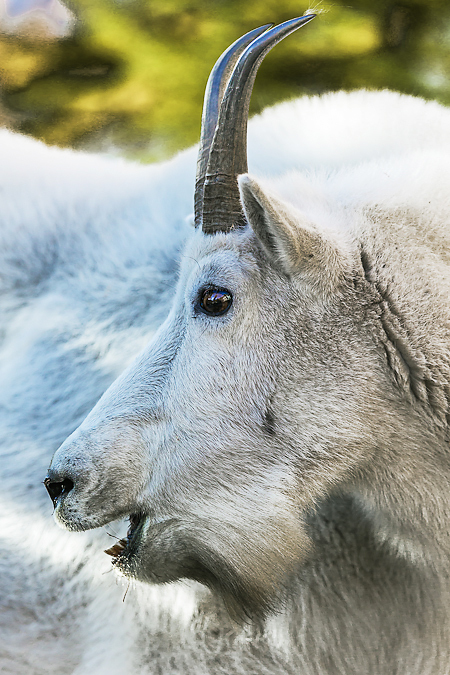 Did you realize that Mountain Goats can learn English? 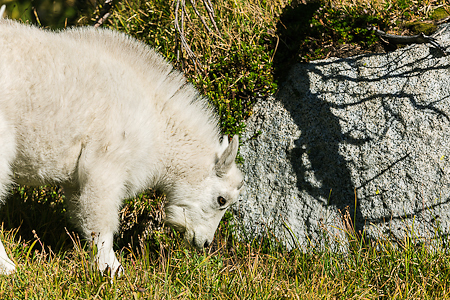 And on that note, I’ll just say that, whatever the reason we had the company of Mountain Goats, we sure enjoyed them. 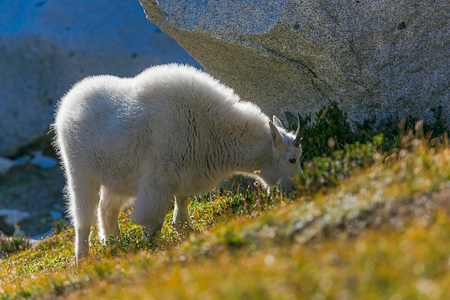 We enjoyed them even more when they were grazing sedges in the meadows, browsing larch needles, or chewing their cud while resting on a snow field–behaviors that seem seem more natural than following hikers to a private spot. 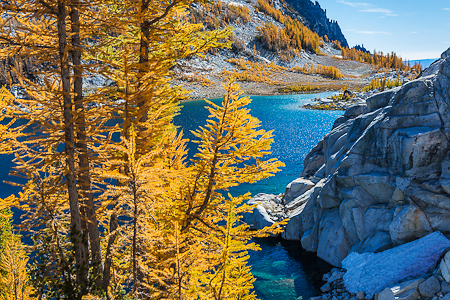 For more information about hiking in The Enchantments, go to Washington Trails Association and Recreation.gov. 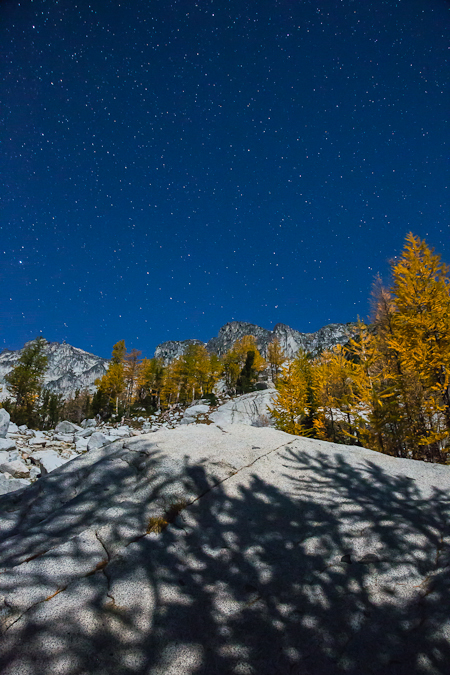 To read my first blog about The Enchantments, go to The Long Ascent.